Axis Paragliding and Paramotoring01873 850111work ParaglidingAxis provides small groups (max 8) and individuals the chance to experience a paragliding Tandem Flight, or an introductory days training in the sport. This Introductory day is the first day of a BHPA approved training course to learn to fly a paraglider solo. In all around 8 full days of training are needed to complete the BHPA Club pilot level. This training can be taken ad hoc and day by day, although advance booking is always required. Axis also train abroad and have a regular programme of courses in France and Morocco. There are no age limits for tandem flights, but a 95kg upper weight limit. Solo training can begin from 14 yrs old. Axis also provide Paramotor training in South Wales. Axis provides small groups (max 8) and individuals the chance to experience a paragliding Tandem Flight, or an introductory days training in the sport. 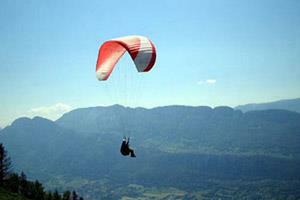 This Introductory day is the first day of a BHPA approved training course to learn to fly a paraglider solo. In all around 8 full days of training are needed to complete the BHPA Club pilot level. We are open throughout the year, and run courses all year weather permitting. office hours are 9am - 7.30 pm.